Overview: New Orleans based Blanchard & Company has a storied history in the metals market, so much so that Jim Blanchard held conferences around the country in the 70’s, daring officials to arrest him for owning gold! (A man after our own hearts!) Blanchard continues its leadership in many ways to this day. 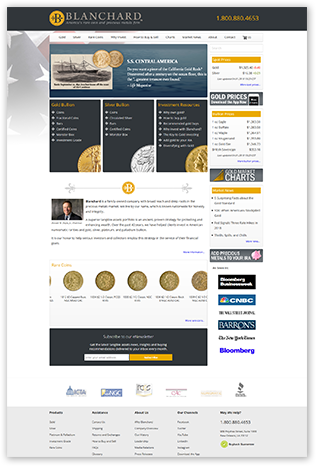 Blanchard and Company, Inc., was founded upon and continues to be driven by the belief that precious metals and rare coins possess unique qualities that make them attractive holdings for any long-term investment strategy. The hard work of two Blanchard visionaries — Jim Blanchard and Donald Doyle — helped pave the way for the millions of investors today who leverage these tangible assets to enhance and protect their wealth. Click to see how Apmex stacks up against the best gold companies! Blanchard Gold has a very informative website with a good amount of content to help potential customers understand their options when it comes to gold investments. The website content is perhaps slanted more toward in American numismatics such as rare and collectible coins than some of its competitors, but there is plenty of information about gold bullion, gold bars, and other ways to invest in gold aside from Blanchard’s coins. The Blanchard and company site is well designed and easy to navigate, with digestible chunks of information that won’t overwhelm the casual reader, and there is generally enough depth to satisfy more seasoned customers. One interesting page is Blanchard’s diversification strategy page that lays out fairly specific advice for portfolio diversification. They also link to their buyback guarantee page from the footer, which is a nice assurance to show visitors. Social media sites probably won’t improve the performance of your gold IRA company, and it may not increase your confidence in their trustworthiness or customer service. However, we do think it proves the company is engaged with their market and is making an active attempt to reach out to their audience in meaningful ways. As we mentioned in our overview, Blanchard has a storied past in the precious metals industry and Jim Blanchard played an instrumental role in shaping the industry as it stands today. He not only founded Blanchard & Company, but he also co-founded the ICTA watchdog group in 1983. It was surprising to us that this well-regarded company did not fare better in our “Trust Factors” section for it’s Blanchard Online property, particularly with Business Consumers Alliance, where they have a overall rating of ‘BBB’. That’s a “good” score, but well beneath the top grading. It was also puzzling that Blanchard had only a single review at TrustLink, especially when that review was so negative. Otherwise they have a low level of complaints or scams reported, which is good news for investors looking to partner with Blanchard gold. Blanchard surely stands near the top of their industry, but we would prefer to see more, and better, Trust Factors ratings from clients/customers that have already used their services. If Blanchard was able to match the feedback of other gold dealers with less experience, we are confident that consumer confidence in their services would be more easily won.